Tell us a perfect Yogurt and cereal combination in 48 hours! Activia is creamy, delicious bifidus yogurt that helps to naturally and gently regulate your digestive system when eaten on a regular basis. It is sold in more than 50 countries and people love it. 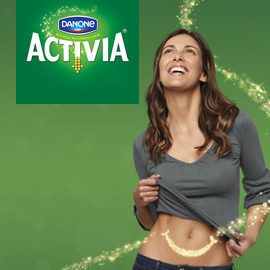 Women who love Activia are very concerned about their health. They like Activia, because it regulates digestion. The benefit for them is that when digestion is not a problem anymore, they can dedicate themselves to something that matters more… and live life the way they want! There’s always been a good fit between Activia and cereals because both are good for digestive health. In some countries, Activia already has a yogurt with cereals but they would now like to move a step further and create THE ultimate yogurt with cereals for these women. Invent the perfect combination of Activia and Cereals that is new and appealing to modern women who like to control their health. Contest ends in 48 hours!